What did we do before wraps came on the scene? While your typical bread-based sandwich is still a huge favorite, there’s something about sandwich ingredients that are neatly tucked and rolled in a wrap that feels special. 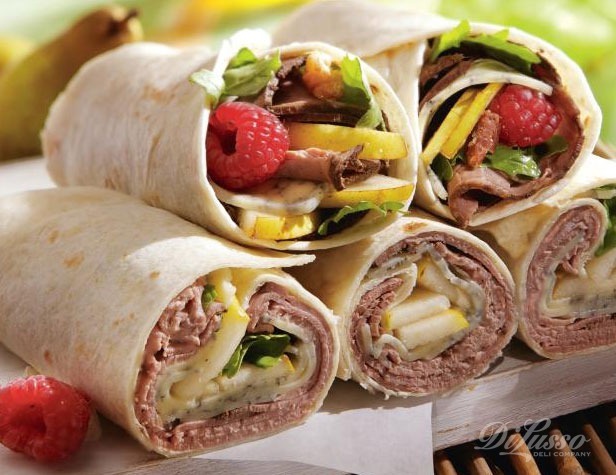 Wraps are pretty, easy to eat, and, for those who monitor such things , often have less carbs and calories than traditional sandwich breads. 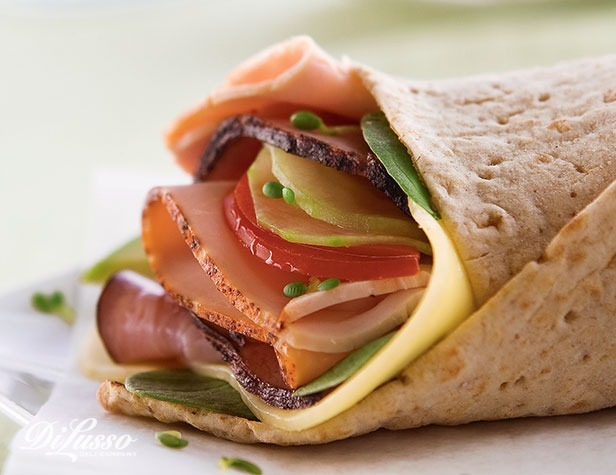 We love inventing wraps with DI LUSSO® meats and cheeses, with plenty of other unexpected flavors and textures included to make them extra special. 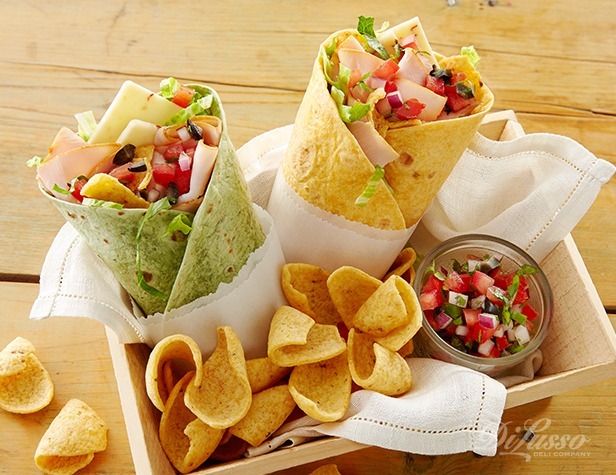 A wrap cut in half can often serve two people (children, or others with smaller appetites); a whole one, served with a few sides like a cup of soup, a fruit cup or green salad or French fries, can make a wrap the centerpiece of a complete meal. 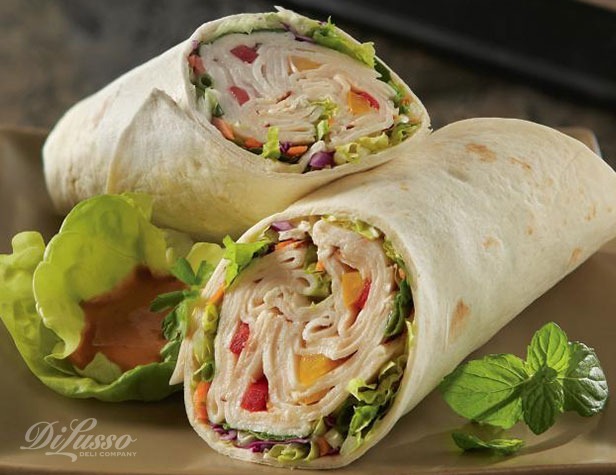 We have five wonderful wraps we’d like to share with you. 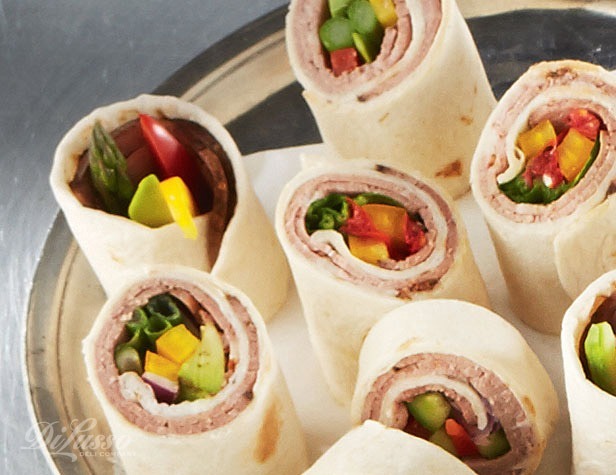 First, our Roast Beef Appetizer Wraps. Don’t let the name throw you—these are great cut up for apps, but every bit as delish served whole for any occasion. London broil roast beef, horseradish, bell peppers, asparagus and avocado are all rolled together in a flour tortilla. Try some Asian flavor with our Thai Basil Wrap—a tantalizing combo of oven roasted chicken, fresh herbs, crunchy veggies and tangy peanut sauce. The Ranch Club Wrap, on the other hand, is a great all-American choice. sun-dried tomato turkey, deli deluxe ham, and baby Swiss, along with plenty of lettuce and other veggies and drizzled with beloved Ranch dressing, make this almost like a salad you eat with your hands. Fill burrito-sized tortillas with seasoned roast beef and Monterey Blue Cheese, along with salad greens, fresh raspberries, candied pecans, and balsamic vinaigrette dressing, and you’ve got our fabulous Monterey Blue and Roast Beef Wrap. Our Mexican-inspired Turkey Tortilla Crunch Wrap features mesquite turkey and pepper jack cheese, taco seasonings, lettuce and tomato and crushed corn chips, all wrapped up in a colorful spinach or jalapeno wrap.